We were attending Ramachandra Guha’s fourth or fifth book launch in Mumbai —forgive me for losing track. Guha is such a prolific historian who pens so many tomes with such ease, his genius totally astounds and stumps folks like me, who eventually stop counting. 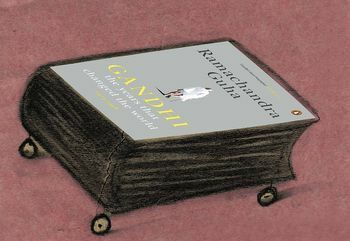 His latest work Gandhi: The Years That Changed the World, 1914-1948 is one more 1,000-pager, that is so heavy that, readers may require a mini-crane. I am intimidated and daunted by Ram and his book. I am not planning to read it. But my husband, most definitely, is. Please note, I do not address the public intellectual as “Ram”. I am deferential and meek in his presence, not chummy. Critics and jealous authors call him “overbearing”. This is entirely understandable. Ram has to deal with pesky fans who constantly bombard him with idiotic questions. Lesser beings (most of us) are treated with studied kindness by the great man. But, even his cultivated patience snaps at times and that is when one catches Ram in full flow—dismissive and imperious, sarcastic and caustic. I like that. Humility does not suit everybody. He is a superlative orator and can hold audiences spellbound. Once, many years ago, we were on a lit-fest tour in South Africa. A prominent author dropped out ungraciously at the last minute, leaving a scheduled slot or two open. The poor organisers approached Ram and asked timorously if he would fill in for the writer who had ditched. Ram sportingly agreed. And, what a performance it turned out to be. He spoke for an hour (without notes) on one of his favourite subjects—cricket. Ram reeled-off anecdotes, dates, personal stories in a manner so engaging, he had the crowd begging for more. I was overawed by his delivery. Ram clearly has a magnificent obsession—Gandhi. He has researched every aspect of his life with such thoroughness and precision, Ram probably knows Gandhi better than Gandhi knew himself. Listening to him talk about his latest book, it was as if he was discussing the intimate details of his best friend’s life. Maybe that is exactly what the Mahatma has become—Ram’s best friend. This book comes with a teaser of a revelation—Gandhi’s “spiritual affair” with the cerebral, beauteous and sophisticated Sarala Devi Chaudhurani. Ram is not the first historian to allude to this relationship. But, he is certainly the first writer to put it out there as boldly. And why not? For too long, we have stopped regarding Gandhi as a flesh-and-blood man, and converted him into a sexless saint, a God. We cannot imagine him falling in love with a woman and desiring her. Whether or not this “affair” remained unconsummated, nobody can say for sure. Ram assumes it did. What a pity. During the one hour book discussion, Ram effortlessly ran through historical nuggets, complete with cross references that left the audience awestruck. Leafing through the book, I started with the last page first. Here is a tantalising quote, “Gandhiji had no private life as we Westerners understand the expression.” The quote is attributed to Reginald Reynolds—“an English Quaker who interacted with Gandhi over a period of twenty years.” Ram also threw it in casually that his editor had knocked-off 40,000 words from the original manuscript. I immediately thought he could spin-off yet another Gandhi-book out of the discarded material. Ram also said more than once that the real “hero” of his latest book is Gandhi’s loyal secretary, Mahadev Desai. Maybe we can expect a comprehensive biography of Desai’s next. How does Ram write so well and write so much? Silly question. He just does!